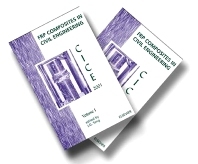 This Proceedings contains the papers presented at the International Conference on FRP Composites in Civil Engineering, held in Hong Kong, China, on 12-15 December 2001. The papers, contributed from 24 countries, cover a wide spectrum of topics and demonstrate the recent advances in the application of FRP (Fibre-reinforced polymer) composites in civil engineering, while pointing to future directions of research in this exciting area. Chapter headings. Sample of contents. Keynote Papers. A model specification for FRP composites for civil engineering structures (L.C. Bank et al.). Durability of FRP reinforcement as concrete reinforcement (T. Uomoto). Design Codes and Guidelines (Invited Papers). Design and construction of building components with fibre reinforced polymers - A new Canadian standard (M.S. Cheung). Building a composites standards infrastructure (G.D. Sims). Materials and Products. Composites with 3-D stitched fabrics (V. Shekar, H.V.S. GangaRao). Reinforcement and retrofit of concrete structures with aramid fiber (A. Sumida). Confinement of Concrete in Compression. A new stress-strain model of FRP-confined concrete (L. Lam, J.G. Teng). Compressive strength of FRP-confined concrete in rectangular columns (L. Lam, J.G. Teng). Bond Between FRP Plate/Sheet and Concrete. Axial intermediate crack debonding of plates glued to concrete surfaces (R. Seracino). Flexural Strengthening of Concrete Beams. Experimental study on the flexural behavior of RC beams strengthened with CFRP laminates (W. Yi, H. Huang). Reinforced concrete beams damaged and repaired with GFRP: dynamic testing and modelling (G. Pascale, B. Bonfiglioli). Analysis of the deformability of concrete beams strengthened with FRP sheets (M.A. Aiello, L. Ombres). Interfacial Stresses. Analysis of stresses developed in FRP plated beams due to thermal effects (S.R. Denton). Plate end shear stress in composite strengthened beams with cracked concrete sections (C.K.Y. Leung et al.). Debonding Failures in FRP-Strengthened Concrete Beams. Strength model for intermediate flexural crack induced debonding in RC beams and slabs (J.G. Teng et al.). Flexural strength of RC beams strengthened with FRP plate (W.F. Wong et al.). Shear and Torsional Strengthening of Concrete Beams. Debonding failure strength of RC Beams shear-strengthened with FRP (J.F. Chen, J.G Teng). Torsional strengthening of reinforced concrete beams (A. Ghobarah). Strengthening of Concrete Columns. Strengthening of rectangular RC columns using FRP Systems (K.H. Tan). Composite plated columns (Y.F. Wu et al.). Seismic Retrofit of Concrete Columns. Seismic retrofit of bridge columns with CFRP jackets (M. Saatcioglu, G. Elnabelsy). Use of FRP composites for seismic upgrade of concrete columns (S.A. Sheikh). Strengthening of Beam-Column Joints. Analysis of FRP-strengthened RC beam-column joints (C.P. Antonopoulos, T.C. Triantafillou). Strengthening of Historic and Masonry Structures. Strengthening and stiffening of historic wooden structures with CFRP (U. Meier). Out-of-plane shear strength of masonry walls (S. Hamoush et al.). Recent Developments in Strengthening Techniques. Bond behavior and seismic retrofitting effect of polyacetal fiber sheet (T. Ueda). Retrofitting method of concrete structures with FRP grids (S.J. Yoon et al.). Concrete Structures Reinforced or Prestressed with FRP. Studies of concrete structures with FRP Bars (W. Xue). Behaviour of one-way concrete slabs reinforced with CFRP grids (B. Zhang et al.). (M.W. Sim, J.S. Wang). Miscellaneous. Author index. Keyword index.